Congratulations to the 56 schools from 4 islands that participated in the 2014 Hawaiʻi School Bottle Cap Collection Challenge sponsored by Kōkua Hawaiʻi Foundation. Through this initiative, 21,862 pounds of plastic bottle caps were collected and diverted from Hawaiʻi’s waste stream. The plastic caps collected have been sent to California, where they will be recycled into new products, including Method’s Ocean Plastic bottle and Preserve toothbrush and razor handles. Mililani Mauka Elementary School collected the most caps overall and St. Elizabeth School in ʻAiea collected the most caps per student. 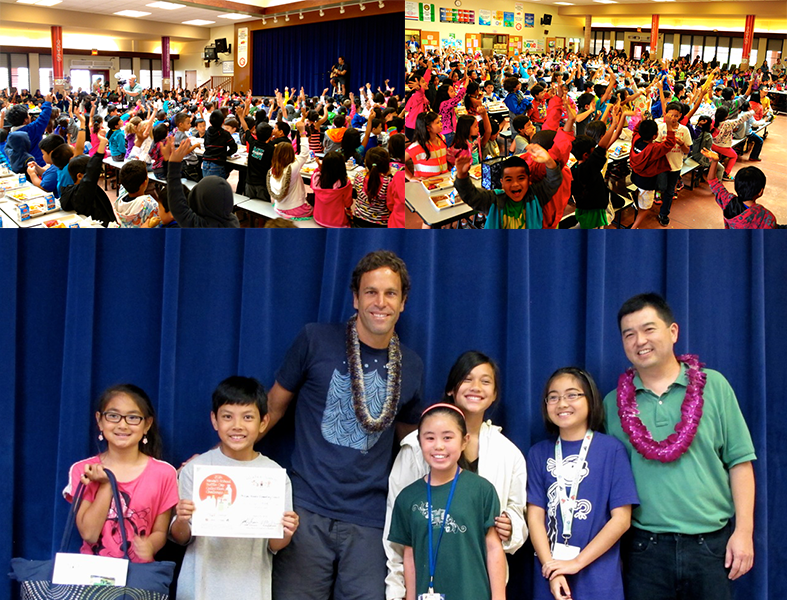 Both of these schools win a special musical performance by Kōkua Hawaiʻi Foundation co-founder Jack Johnson. Johnson dropped in on the Mililani Mauka students yesterday and treated them to a surprise lunchtime concert and St. Elizabeth students will get their surprise concert very soon. The top twelve schools were all rewarded with great prizes, including a Waste-Free Classroom Celebration Kit complete with cloth napkins, reusable Preserve cutlery, cups, plates, and Method Ocean Plastic dish and hand soap. 1st Place Elementary - St. Elizabeth School - Most Caps Per Capita! The Kōkua Hawaiʻi Foundation blog page includes several great stories and photos from schools about their participation in the challenge. Mahalo to our partners who supported this year’s Challenge: Method, Preserve, RRR Recycling Service Hawaiʻi, T&N Computer Recycling, Aveda, and Sustainable Coastlines Hawaiʻi. Kōkua Hawaiʻi Foundation will be holding another Hawaiʻi School Bottle Cap Collection Challenge in 2015. The environmental education non-profit encourages everyone to reduce and reuse and first steps to minimize waste and pollution.